Domain crawl of the Luxembourg web domain (.lu) performed by Internet Archive on behalf of the National Library of Luxembourg / Bibliothèque nationale de Luxembourg in December 2017 and January 2018. What is more important than that your web presence is always available and fast, and that you can always be reached via e-mail? Our web hosting ensures short loading times and that your presence functions reliably. Once set up, you can make a lot of adjustments yourself and, when there is a snag, we’re here to support you, free of charge. In addition to a secure hosting environment and reliable backup systems, our web hosting service includes almost unrestricted traffic and e-mail forwarding, web statistics, a free spam and anti-virus filter service and an easy to use webmail interface. In addition, each customer also receives a tutorial on how to set up e-mail addresses and a summary of the individual web/e-mail hosting setups. Our web hosting offer includes its own administration area, where the customer can manage their own e-mail accounts, databases, spam and anti-virus filter, as well as other settings. We provide free support all the time for any questions our hosting customers may have about hosting or website maintenance. Websites which take too long to load are clicked closed by Internet users and fall sharply in the rankings of what is possibly the most important search engine: Google. We host websites on our own servers, so you can count on the top response times for your Internet presence. These are located exclusively in European data centres, to guarantee the shortest possible communication paths. Of course, we can also set up a hosting operation on your own computers at your company’s location. We offer non-profit organisations and private individuals a 50% discount for our services. However, our engagement and your benefit remain just as great. Just get in touch with us for a full quote. Does Webhoster have a “Control Panel” or some other utility to manage my website? 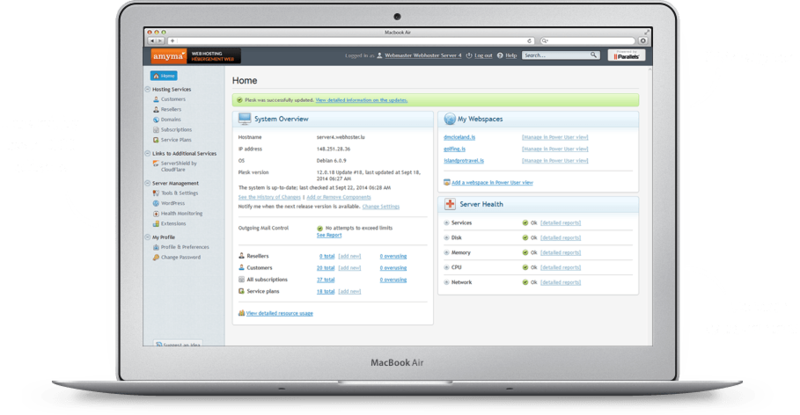 Yes, Webhoster features an enhanced user interface that is fully integrated with Plesk from Parallels. Our single-sign on control panel gives you access to domain registrations, SSL certificates, and other hosting account features. Our hosting accounts feature Plesk which is the industry leading control panel and provides a rich online environment from where you can manage your web hosting. Can I add software to my account? When you fill out the request form, please make sure that you add all your contact details and the domain name you would like to register. We will register the domain for you as soon as you sign the offer that we will send you by email. How many databases do I need? If you plan to install WordPress, Drupal, Sefrengo, Typo3, Joomla or any content management or ecommerce solution, you usually need 1 database, which is included in the basic hosting package. More databases are available upon request. A Pure Player Web Agency: The ten-person staff backed by 24 years of market experience makes Amyma one of the rare companies on the Luxembourg market that can be considered a Pure Player Web Agency. As such, we concentrate our business exclusively on the internet; our web related activities do not include any other area of communications / advertising or general IT development. In this way, we are able to provide services and web specialist support to our customers. As a company, we are in no way bound to the terms and methods of proceeding inherent to other sectors. Complete knowledge of the internet: One would think that this is self evident, yet a good number of companies continue to believe that creating an internet page can be done using the same principles as creating a poster or even a magazine. In fact, this isn't true at all and it is only by adapting to the requirements of this new media that companies can produce web pages that speak to internet users. Excellent knowledge in the area of web design: Formatting, information, interaction, graphic design and technical expertise: these mutually complementary areas should all be taken into account in designing internet pages. All Amyma employees are in full control of their work sectors and understand the changes and trends that are occurring within them. A methodic approach focused on solutions: The choice of methods to implement as part of a project is made based on an objective that, while very simple, is often neglected during the design phase of an internet page. It involves bringing sales objectives in line with the expectations of users in order to develop a solution that is satisfactory to both parties. The method that we use was set out and developed over several years. With this, we are able to meet the expectations in the area of management and design of web projects. Experience in the area of key accounts: Amyma has concrete experience in managing and implementing projects, both for large companies and major international groups like Island ProTravel, Iseland Tours, Mentis Cura and CFM (Van Marcke), as well as for Luxembourg companies. Control of design resources: Each individual phase of the design of a web site requires specific tools. These include tools for site plan setup, wireframes, HTML compliant pages, secure and effective code programming, etc. We have always been able to use our quality training and experience to expand our expertise and knowledge of elements essential to creating web pages. Professional provider of open-source systems: Our objective is to guarantee the availability and security of different types of software and IT environments and to this end we have implemented a wide range of processes and resources such as technological watch, regular audits, failsafe and backup systems, etc.